The "photography" of this great cartoon is quite beautiful at times, so even though it's a kiddie cartoon, widescreen would add a lot to the experience. Far more imaginative and ambitious than the trivial, cash-in features Nickelodeon has made from its other animated TV series, "The Wild Thornberrys Movie" is a funny, original, whimsical but meaningful story of an intrepid 12-year-old girl's adventures in Africa. Directors Cathy Malkasian and Jeff McGrath get off to a bit of a clumsy start, catching up uninitiated audience members with a rushed, "the story so far"-style prologue that establishes the Thornberrys as globe-trotting naturalists (can-do American mother and pith-helmeted English father host their own cable TV nature show). In the first two minutes a busy voice-over also explains that nerdy heroine Eliza (all freckles, braces and braids) was given the ability to talk to the animals by a tribal shaman, and that she'll lose the gift if she ever tells anyone about it. Obviously this fact will come into play, because it's greatly emphasized. But soon Eliza's adventures begin in earnest, when she's packed off to boarding school -- on the advice of her priggish blue-blood grandmother -- after almost being kidnapped by poachers while playing with some friendly cougar cubs. Even though her monkey best friend sneaked a ride in her luggage, Eliza is miserable being cooped up in England and stuck with a snooty roommate. So after making too few friends and being punished for a bit of monkey havoc, she runs away and returns on her own to Africa, determined to rescue the baby cougar taken by the poachers and save a herd of elephants they're targeting in an elaborate ivory-smuggling plan. Well-measured themes of responsibility and self-confidence run through the story as Eliza (whose eager but sympathetically timid voice is provided by Lacey Chabert from "Party of Five") and the monkey make their way across jungle and veldt, encountering friend and foe. Meanwhile, her amusingly sarcastic teenage sister (Danielle Harris), who was, like, totally "omigod!" that Eliza got to go to boarding school while she had to stay in the icky jungle, hops on a motorcycle and braves the nuisance of nature to help find her runaway sibling. 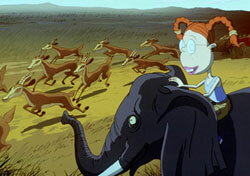 The movie's uniquely styled animation blends graceful, realistically drawn animals and locations with its signature, caricature-like humans, who have large, potato-shaped heads perched on skinny necks atop either gangly bodies (the kids) or pudgy ones (the adults). A magical, palpably aboriginal ambiance is created with the help of a great soundtrack of Peter Gabriel and Paul Simon songs, and the unexpectedly tart sense of humor has just the right tenor. The 'toon's comedy will get kids and adults laughing at the same gags (a food fight at the boarding school is a hoot) and the same lines ("I'm beginning to see why they call you Thunder," the monkey says to a horse that breaks wind). "The Thornberrys" provides an earnest sense of safari life too, with the family living in an RV thoroughly equipped for roughing it. And even when the plot succumbs to the occasional cliché (why does someone always end up floating toward a waterfall in African jungle movies? ), it seems to do so with its tongue at least in the vicinity of its cheek. All the Thornberrys but Eliza seem obnoxious at first (pushy grand-"mumsy" on one end of the spectrum and an adopted wild jungle boy on the other), but most of them grow truly likable as their characters develop -- which they do in unique ways that indicate a real effort on the part of the filmmakers to create a kids' picture uncommonly perceptive about the nature of kids. This is one of the many ways in which "The Wild Thornberrys" is a vast improvement over Nickelodeon's "Rugrats" and "Hey Arnold!" movies. This extra effort makes it easy to forgive the movie a few plot conveniences and nit-picky annoyances (why do Eliza's parents ever agree to ship their kid away from her beloved habitat in the first place?) on its way to a genuinely exciting climax involving an eclipse, a rare elephant ritual, and a the whole Thornberry clan trying to rescue the pachyderms from ruthless poachers in helicopters.